Credit Report Fraud Alert or Security Freeze: Which is Best? Credit Report Fraud Alerts and Security Freezes: What's the Difference? Placing a fraud alert or credit security freeze on your credit reports are among the steps you can take to protect yourself when you're a victim of credit card fraud. But what's the difference between the two, and which one should you choose? With a fraud alert on your credit reports, creditors must verify your identity before establishing any accounts in your name. Say, for instance, someone posing as you tried to open a credit card account. The fraud alert would foil the crook's attempts because after doing the required checking, the creditor would learn that you were not the one who filled out the credit card application. You can choose an initial fraud alert, which stays on your report for at least 90 days, or an extended alert, which stays on your credit reports for seven years. A security freeze locks your credit files at the three credit reporting bureaus, Equifax, Experian, and Transunion, so no one can access them. The action stops crooks from opening new accounts in your name because creditors can't get access to your credit reports or credit score. But while a security freeze prevents impostors from opening fraudulent accounts, it also keeps out potential creditors, landlords, insurance companies, utilities or employers that are responding to applications you submitted. To get around this, you can unfreeze your credit reports by using a password to give a company access, but the process might be a hassle if you're in the market for a mortgage or a new job and are submitting multiple applications. Credit Report Fraud Alert or Freeze: Which One? 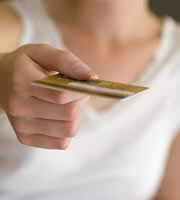 A fraud alert is the better answer if you merely suspect you might become an identity theft victim. If someone has already tried to open accounts in your name and the thought of the invasion is keeping you up at night, then consider a security freeze. Consumers Union also recommends a security freeze if your social security number was part of a security breach. A security freeze might not be the best option if you're planning to apply for credit or jobs frequently. Depending on your where you live, you may have to pay a fee each time you lift a freeze. Check each of the credit reporting bureau's Web sites to learn more about fraud alerts and security freezes and check the details of your state's rules regarding them. 0 Responses to "Credit Report Fraud Alerts and Security Freezes: What's the Difference?"